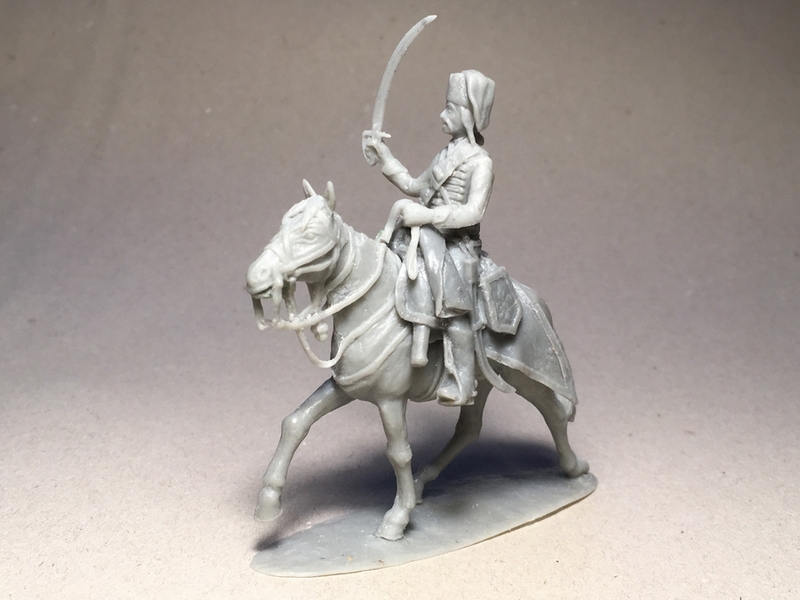 Starting from a resin casting of my ambling horse mannequin (see here), I have sculpted a tacked-up hussar horse master. I have also sculpted draft masters of the saddle-cloth, of the hussar’s weapons, and of a mounted figure in Hungarian dress that will be the base for all my hussars (in the early-to-mid 18th Century all hussars serving in the armies of the various European powers wore very similar uniforms that differed only by their color scheme and minor details such as the devices on the saddle-cloth and Säbeltasche). As regards the horse tack, I have based the rather intricate headgear on the well known, exceptionally detailed paintings by David Morier, ca. 1748, depicting the uniforms of Hungarian hussars in the Austrian service. The saddle-cloth, or Schabracke, and the saddle straps, are also based on Morier’s paintings, cross-referenced with a few other period representations, as well as pictures of Seven Years War and Napoleonic re-enactors (I find historical re-enactment pictures very useful in complementing primary sources, because, unlike most period artists, re-enactors are concerned with how the real thing actually looks and works, and usually are obsessed with detail…). The hussar’s kit included a cloak and a blanket. The cloak was normally rolled under the back-end saddlebow and covered by the saddle-cloth, and as such is not visible in the model. The blanket was rolled at the horse’s withers, either below or above the saddle-cloth. I decided to retain both options, and sculpted the blanket as a separate part. This, as well as painting the blankets different colors, will allow for some degree of variety within the same unit (some hussars had a sheep-skin cushion on top of the saddle-cloth as well, but for that I will have to sculpt a different saddle altogether…). In order to simplify the design of the two-part rubber molds, I have sectioned the saddle-cloth draft master in two parts: right-hand and left-hand side. For the same reason, I have also made the legs of the trooper’s mannequin separately, so as to make the master’s legs, the stirrups, the Säbeltasche, and the saber scabbard all integral with the corresponding saddle-cloth section. In spite of the intricacy of the scabbard and Säbeltasche suspension straps, the whole thing came out reasonably well. The hussar’s torso, head and arms are all separate parts, allowing for easy characterization and pose variation. The Morier paintings show all hussars wearing the same hairstyle, consisting of two side knots covering the ears, and one at the back of the head. Other period sources show the hair braided at the sides of the head. Hussar headgear consisted of either a fur hat with colored cloth bag, or a black felt winged cap (Flügelmütze). Apparently, fur hats prevailed in the Austrian service, but Morier also show hussars wearing felt caps, as was the case with the Prussian hussars. The carbine, suspended by means of a snap-hook to a bandolier, or broad belt, passing over the left shoulder, is integral with the torso. I built it converting a resin casting of the trade gun I made for my Indians and Canadians. In the 1740s, Hungarian hussar carbines were not yet standardized, and difference in length and detail had to be rather the norm than the exception. For this reason, while I based my hussar carbine on surviving French and Prussian specimens from the 1730s and 1740s, I did not care to attempt an exact reproduction of neither of the above. Picaud-Monnerat, S. La petite guerre aux XVIII siècle, Economica, 2010. Sapin-Lignieres, Les Troupes Legeres de l’Ancien Regime, Les Presses Saltusiennes, 1979. Die Bewaffnung und Ausrüstung der Armee Friedrichs des Großen, Koblenz + Rastatt, 1986. Müller, H., Das Heerwesen in Brandenburg und Preussen von 1640 bis 1806, Branderburgisches Verlagshaus, 2001.